We have two plants that convert cow dung into bio gas. We then run a recycled automobile engine with the gas, and the engine powers a generator. We have a 14 ft deep and 14 ft wide plant that can run a 13 KVA generator for 3-4 hours when full. We are also constructing a 20X20 ft plant that will power a 30 KVA generator for several hours, we hope. We will soon post picture of both in our photo gallery. There are some on our Facebook page already. 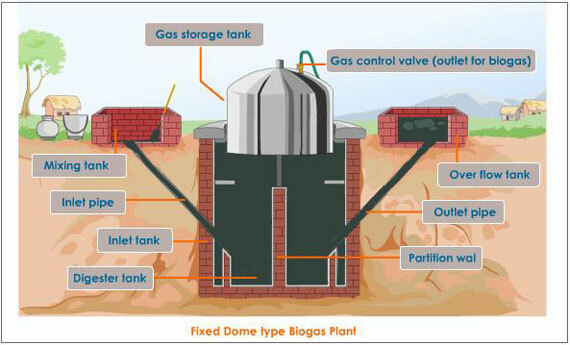 Here is a diagram of a biogas plan similar to ours.